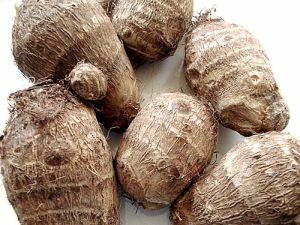 Taro is a common name for the corms and tubers of several plants in the Araceae family. Of these, Colocasia esculenta is the most widely cultivated and the subject of this article. More specifically, this article describes the "dasheen" form of taro; another variety of taro is known as eddoe. The plant is inedible when raw and considered toxic due to the presence of calcium oxalate crystals, typically as raphides. The toxin is minimized by cooking, especially with a pinch of baking soda. It can also be reduced by steeping taro roots in cold water overnight. Calcium oxalate is highly insoluble and contributes to kidney stones. It has been recommended to consume milk or other calcium-rich foods together with taro. Taro or dasheen corms have more calories than potatoes. 100 g provides 112 calories. Their calorie mainly comes from complex carbohydrates known as amylose and amylopectin. However, the roots are very low in fats and protein than in cereals and pulses. Their protein levels can be comparable to that of other tropical food sources like yam, cassava, potato, banana, etc. The corms, however, are free from gluten. They feature high-quality phyto-nutrition profile comprising of dietary fiber, and antioxidants in addition to moderate proportions of minerals, and vitamins. It is one of the finest source dietary fibers; 100 g flesh provides 4.1 g or 11% of daily-requirement of dietary fiber. Together with slow digesting complex carbohydrates, moderate amounts of fiber in the food help gradual rise in blood sugar levels. Taro yellow-fleshed roots have significant levels of phenolic flavonoid pigment antioxidants such as ß-carotenes, and cryptoxanthin along with vitamin A. 100 g fresh taro leaves provide 4825 IU or 161% of RDA of vitamin A. Altogether; these compounds are required for maintaining healthy mucus membranes, skin and vision. Consumption of natural foods rich in flavonoids helps to protect from lung and oral cavity cancers. Further, the corms provide healthy amounts of some important minerals like zinc, magnesium, copper, iron, and manganese. In addition, the root has very good amounts of potassium. Potassium is an important component of cell and body fluids that help regulate heart rate and blood pressure.